Registration has CLOSED! If you have a specific team that you are supposed to be a part of, reach out to us at [email protected] and we'll do our best to place you. There is still plenty of space in certain other leagues as well as our Bar Sport leagues if you still want to play this Spring! Volleyball teams vary in size based on which type of league it is. There may be gender requirements for certain leagues. Please check your rules sections. We allow individuals, small groups and teams to all join our leagues. DC Fray reserves the right to add additional players to ANY team that is under the official roster size for the league. During registration captains can pick up free agents or mark their group as ready to merge via commish. After registration closes DC Fray goes through and finalizes rosters by placing free agents, merging groups and deleting unpaid players. Being a promoted team does not mean you may not receive additional players. Teams who want to “lock” their roster may prepay for a team at the official roster size. Example, 6v6 volleyball is 9 players officially but your team only wants 6 players. You can purchase a team spot for a roster of 9 and only fill your desired number but those additional spots are technically used and are not refundable. First and foremost all DC Fray leagues are 50% Social and 50% Sport. We do have officials; however, we expect individuals to respect the league’s culture of fair and fun play. Foul language and rough play will not be tolerated and individuals who cannot adhere to our standards of fair play and sportsmanship may be asked to leave the league. DC Fray wants everyone to have a fun and be social while enjoying a great sport. DC Fray will do whatever they can to make sure all players are having fun. A best-of-3 format will be used for all matches. Generally, USVBA rules will be used. DC Fray is proud to relieve captains of the burden of paying for full teams. While captains and players are able to prepay for additional players and or full teams, it is not a requirement for participation in our leagues. We welcome individual player payments. We are also proud to welcome those who do not have a full team (small groups and free agents) to participate in our league. Our primary mission is to make it easier for people to have fun and get involved with social sports and these policies help accomplish that goal. Because of these policies, all registrations are on a first come first serve basis and any roster that does not reach our standard size (based on each sport) is eligible to receive free agents and or small group by the league. Rosters made up of primarily free agents and or a collection of small groups may field more players than the standard roster size. This policy is in place to help ensure free agent teams are able to consistently field teams each week. 1. All players must be at least 21 years of age prior to participating in any Match and must be registered and in good standing with DC Fray Volleyball (herein: the “League”). A. Competitive nights will be required to have six (6) players, consisting of a minimum of two (2) women, but may have as many players on the roster as a team chooses with no other restrictions. B. If a team of “free agent” registrations is assembled by the League, it will have no more than twelve (12) players. 3. Each team may have six (6) players (exception for Athletic Leagues where is this 4 players) on the court at one time. A. For 6v6 If a team has two (2) women present, it may play with three (3) men and two (2) women on the court. B. For 4v4 games if a team has one (1) woman present it may play with two (2) men and one (1) woman on the court. 4. As long as two (2) members of the team are present during the regular season, a team may use substitute players who are registered and in good standing with the league to field a full team.During the playoffs, teams may only use players on their roster. 1. Teams and players are responsible for calling their own faults during play. 2. Teams may be asked to provide one (1) referee for games before or after their own match to act as a referee (there will be a schedule). Referees will be the official timekeepers. 3. Referees’ will be positioned, during game play, at the center line. 4. Referees’ primary responsibilities are to serve as an arbitrator for difficult calls, start and maintain game flow, ensure the safety of all participants and spectators, and enforce the Sportsmanship Code. It is the PLAYERS’ responsibility to identify faults when they occur. 5. League officials have the authority to eject anyone before, during and immediately after any match if they feel it is warranted. All decisions made by referees are final. 1. Volleyball is a self-regulated game that relies on the Honor System. If a fault occurs, you are expected to call it as such. 2. Referees are there to rule on unclear plays, settle disputes, keep the game moving and ensure player safety. While they will at times call a fault, a lack of a call by a Referee does not remove your obligation to abide by the Honor System. 3. Players must treat their fellow volleyball players, referees and spectators with respect and courtesy. Personal and malicious remarks directed at anybody in the volleyball community, obscene or otherwise, at any time, have no place in the League. 4. Players must respect the authority of the referees to regulate the game and abide by their decisions. Referees’ decisions are final. 5. Team captains must be the only players that address concerns to referees and league officials. They are expected to do so in a courteous and respectful manner, and to confine their discussions to interpretations of the rules and not challenge referees’ decisions regarding judgment. 6. Players are expected to comply with the intent and spirit of the rules. Deliberately attempting to violate the rules is unacceptable. 7. Teammates rely on players attending the games. If you fail to attend at least 3 games with no excuse, you may be replaced on the roster if both the captain and league management agree that it is best for your team. 1. The Referee or league host will have a game of Rock,Paper,Scissors with the team Captains to determine the choice of serving first or choosing a side for the first game. 2. Teams will switch sides for the second game and the team who did not serve to start the first game shall serve to start the second game. 3. A 45-minute time limit will be placed on all games. If time expires in the middle of a game, the team with the most points will be declared the winner of that game. If less than a two (2) point difference exists between scores the referee or league host will set a cap and the teams will play to that point. 1. Teams will forfeit one (1) game for every ten (10) minutes past the designated start time that they do not have the legal amount of players. 2. If a team does not have the minimum number of players present 10 minutes after the designated start time, the entire match will be forfeited and the team that is present will be declared the winner. 3. If you know in advance that your team is going to need to forfeit a game, we encourage you to contact us as soon as possible. We will do everything that we can to reschedule your game, but this does not mean that your team will not receive the loss as a forfeit if we cannot accommodate your needs. 4. Playoff Eligibility: teams that notch more than two (2) forfeits in one (1) regular season will not be eligible for the playoffs. 1. A game ball will be provided by DC Fray. Teams may use their own ball if both teams agree to use it. 2. Players must wear athletic, closed-toe shoes (For Indoor Courts). 3. Players must wear the t-shirts provided by DC Fray at all times during League play. Matches will be played as a best-of-3 format. 1. Rec Scoring: Games will be played to 21 points with a cap of 25 points. A team must win by 2 unless both teams are tied with 25 points. Rally Scoring will be used. 2. the third game will be played to 15 points with a cap of 18 points. A team must win by 2 unless both teams are tied with 15 points. Rally Scoring will be used. 3. Scores should be called out loudly before each serve. 1. There is no gender rule (subject to change if men/women are being intentionally excluded). 1. Teams are allowed an unlimited number of substitutions per match. 2. Team members must rotate on the court and remain in that position until the serve has been contacted. 3. The player in the back right-hand corner of the rotation will be designated to serve and continue to rotate clockwise. 4. Any player may block or spike at the net, regardless of rotation. 1. Overhand and underhand serves are allowed. Jump serves are not allowed. 2. When serving the ball, the player has 5 seconds to make contact with the ball before a side-out is called. 3. If the ball is served into the net, if it goes over, it is considered a legal serve. 4. The serve can be returned with a pass or a set. The serve cannot be blocked or attacked at any time. 5. The serve can be made from anywhere behind the end line and within the sideline. 6. A server may not step over the end line until the ball has been contacted. 1. A maximum of three consecutive contacts per side after a serve or block attempt are allowed to return the ball. 2. A block attempt is not considered a contact. 3. No player may hit the ball twice in succession, except after a block. 4. No part of the body may touch the net at any time unless a ball or person driven into the net causes the contact. A. Player contact with the net in a manner not directly relating to or affecting the course of play is not a violation. B. Contact with hair or part of the uniform will not be considered a fault. 5. When executing a block or spike, a player may follow through over the net, as long as the individual does not interfere with players on the other side of the net. 6. Out of bounds is the area outside the designated court line. The line is IN bounds. 1. Alcohol is not permitted inside the volleyball facility, on the grounds, or any place where prohibited by area rules. Players caught with alcohol will be REMOVED FROM THE LEAGUE WITHOUT REFUND. Our permits are too valuable to risk! 2. If League officials have reason to believe a player is too intoxicated to play, that player will be ejected. 3. League Management reserves the right to suspend or expel any player from the league for any reason without refund. All players must be at least 21 years of age prior to participating in any Match and must be registered and in good standing with DC Fray Volleyball (herein: the “League”). Team rosters for 6v6 leagues must have a minimum of eight (8) registered players (minimum of 3 women). Team rosters for 4v4 leagues must have a minimum of six (6) registered players (minimum of 2 women. There is no cap on the number of players per roster in either league. The more, the merrier! If a team of “free agent” registrations is assembled by the League, it will have no more than twelve (12) players. Each team may have six (6) players (exception for Athletic Leagues where is this 4 players) on the court at one time. For 6v6 If a team has two (2) women present, it may play with three (3) men and two (2) women on the court. For 4v4 games if a team has one (1) woman present it may play with two (2) men and one (1) woman on the court. As long as two (2) members of the team are present during the regular season, a team may use substitute players who are registered and in good standing with the league to field a full team.During the playoffs, teams may only use players on their roster. Teams and players are responsible for calling their own faults during play. Teams may be asked to provide one (1) referee for games before or after their own match to act as a referee (there will be a schedule). Referees will be the official timekeepers. Referees’ will be positioned, during game play, at the center line. Referees’ primary responsibilities are to serve as an arbitrator for difficult calls, start and maintain game flow, ensure the safety of all participants and spectators, and enforce the Sportsmanship Code. It is the PLAYERS’ responsibility to identify faults when they occur. League officials have the authority to eject anyone before, during and immediately after any match if they feel it is warranted. Volleyball is a self-regulated game that relies on the Honor System. If a fault occurs, you are expected to call it as such. Referees are there to rule on unclear plays, settle disputes, keep the game moving and ensure player safety. While they will at times call a fault, a lack of a call by a Referee does not remove your obligation to abide by the Honor System. Players must treat their fellow volleyball players, referees and spectators with respect and courtesy. Personal and malicious remarks directed at anybody in the volleyball community, obscene or otherwise, at any time, have no place in the League. Players must respect the authority of the referees to regulate the game and abide by their decisions. Referees’ decisions are final. Team captains must be the only players that address concerns to referees and league officials. They are expected to do so in a courteous and respectful manner, and to confine their discussions to interpretations of the rules and not challenge referees’ decisions regarding judgment. Players are expected to comply with the intent and spirit of the rules. Deliberately attempting to violate the rules is unacceptable. Teammates rely on players attending the games. If you fail to attend at least 3 games with no excuse, you may be replaced on the roster if both the captain and league management agree that it is best for your team. The Referee or league host will have a game of Rock,Paper,Scissors with the team Captains. The winning Captain will choose to either pick a side or serve for the first set. Teams will switch sides for the second set and the team that did not serve to start the first set shall serve to start the second set. A 45-minute time limit will be placed on all games. If time expires in the middle of a game, the team with the most points will be declared the winner of that game. If less than a two (2) point difference exists between scores the referee or league host will set a cap and the teams will play to that point. For 6v6 leagues, teams must have three (3) registered players present to start a legal game. For 4v4 leagues, teams must have two (2) registered players present to start a legal game. For both leagues, only one more man than the number of women present on the court is allowed. For example, if a team only has one (1) woman present, it may play with two (2) men on the court. Additional registered DC FRAY players who are in good standing with the league may be used as subs during regular season games. NO subs are allowed during the playoffs. Teams that do not have the minimum number of players present ten (10) minutes after the designated start time will forfeit the entire game and the other team will be declared the winner. Teams are welcome to use the court to scrimmage thereafter. If you know in advance that your team is going to need to forfeit a game, we encourage you to contact us as soon as possible. We will do everything that we can to reschedule your game, but this does not mean that your team will not receive the loss as a forfeit if we cannot accommodate your needs. Playoff Eligibility: teams that notch more than two (2) forfeits in one (1) regular season will not be eligible for the playoffs. A game ball will be provided by DC Fray. Teams may use their own ball if both teams agree to use it. Players must wear athletic, closed-toe shoes (For Indoor Courts). Players must wear the t-shirts provided by DC Fray at all times during League play. Games will be played as a best-of-3 format. Scoring: Sets will be played to 21 points and a team must win by 2 points. A cap of 25 points is placed on the first two sets. Rally Scoring will be used. If both teams win a set, the third set will be played to 15 points and a team must win by 2 points. A cap of 18 is placed on the third set. Rally Scoring will be used. Scores should be called out loudly before each serve. There is no gender rule as far as number of ball touches is concerned. For example, three men can touch the ball in a row before it is passed over the net. (subject to change if men/women are being intentionally excluded). Teams are allowed an unlimited number of substitutions per match. Team members must rotate on the court and remain in that position until the serve has been contacted. The player in the back right-hand corner of the rotation will be designated to serve and continue to rotate clockwise. Any player may block or spike at the net, regardless of rotation. Overhand and underhand serves are allowed. Jump serves are not allowed. When serving the ball, the player has 5 seconds to make contact with the ball before a side-out is called. If the ball is served into the net, if it goes over, it is considered a legal serve. The serve can be returned with a pass or a set. The serve cannot be blocked or attacked at any time. The serve can be made from anywhere behind the end line and within the sideline. A server may not step over the end line until the ball has been contacted. A maximum of three consecutive contacts per side after a serve or block attempt are allowed to return the ball. A block attempt is not considered a contact. No player may hit the ball twice in succession, except after a block. No part of the body may touch the net at any time unless a ball or person driven into the net causes the contact. Player contact with the net in a manner not directly relating to or affecting the course of play is not a violation. Contact with hair or part of the uniform will not be considered a fault. When executing a block or spike, a player may follow through over the net, as long as the individual does not interfere with players on the other side of the net. Out of bounds is the area outside the designated court line. The line is IN bounds. If a player crosses under the net and interferes with a play, this is a violation (and it’s VERY unsafe). Alcohol is not permitted inside the volleyball facility, on the grounds, or any place where prohibited by area rules. Players caught with alcohol will be REMOVED FROM THE LEAGUE WITHOUT REFUND. Our permits are too valuable to risk! If League officials have reason to believe a player is too intoxicated to play, that player will be ejected. League Management reserves the right to suspend or expel any player from the league for any reason without refund. How much does it cost to join a DC Volley league? Registration dues vary by location and night. DC Volley strives to keep dues low while still providing a quality experience for our members. Most leagues range in cost from $50 – $89. This fee covers insurance, court costs , equipment, player t-shirts, parties, prizes, recruiting, and the tons of other DC Fray events that we will be hosting throughout the year. You definitely get your money’s worth! Each league gets at least 6 organized nights of games, playoffs (if applicable), league shirts, and league-wide parties where you’ll get to meet literally hundreds and hundreds of other players. You’ll also have access to all our other non-volley related events, shindigs and parties throughout the year. Please note, DC Fray does not issue refunds. 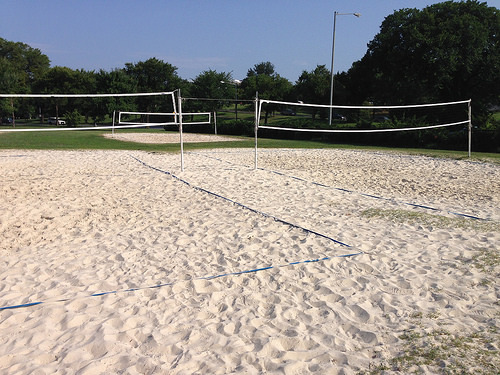 ← How much does it cost to join a DC Volley league? We are first and foremost a SOCIAL company. We are starting to offer different competitive levels for volleyball. Each level from social, gender specific and athletic. Please read your season info page to see if the league is at a different level. What’s a DC Volley game night like? You simply show up at the fields for your scheduled games, you and your teammates play your opponents for about 45 minutes and then everyone heads on over to the nearby sponsor bar for food, drinks, and partying! It’s a ridiculously easy formula that’s seriously fun! Game times vary by location but weekday leagues are run in the evening anywhere from 6pm to 10pm. Weekend leagues vary from morning to evening hours. ← What’s a DC Volley game night like? For 6s, there must be at least 3 of each gender on the roster. On the court, there must be at least 2 of each gender. For 4s, there must be at least 1 of each gender to play but an official game is 2 males, 2 females. ← Are there gender requirements? DC Fray operates a lot like the sports leagues of your youth. Our goal is to connect people and to play more often! Our leagues are 6-8 weeks long with a final championship tournament and end of season party, though we also host one time events as well. From softball, to league parties, to scavenger hunts, DC Fray. organizes the events so all you have to do is show up and have fun! Why should I join DC Fray? DC Fray understands that for most people joining a sports team is about hanging out with your friends, having a good time and meeting some new people. We strive to keep the games fair and stress free so you can do just that… socialize and have a good time! ← Why should I join DC Fray? What’s a DC Fray game night like? You simply show up at the courts/fields/bar for your scheduled games, you and your teammates play your opponents for about 30-60 minutes and then everyone heads on over to the nearby sponsor bar for food, drinks, and partying! It’s a ridiculously easy formula that’s seriously fun! ← What’s a DC Fray game night like? Since the beginning, DC Fray has always been more about meeting people, playing a fun game and socializing afterward at the bar. A few players are naturally more competitive than others but don’t worry, 95% of DC Fray is NOT competitive. How much does it cost to join DC Fray? Registration dues vary by location,night and sport. DC Fray strives to keep dues low while still providing a quality experience for our members. Most leagues range in cost from $25 – $70. This fee covers insurance, field permits, equipment, player t-shirts, parties, prizes, recruiting, staffing at every league and the tons of other DC Fray events that we will be hosting throughout the year. You definitely get your money’s worth! Each league typically gets at least 6 organized nights of games and tomfoolery, and league-wide parties where you’ll get to meet literally hundreds and hundreds of other players. You’ll also have access to all our other league related events, shindigs and parties throughout the year. *Please note, DC Fray does not issue refunds. ← How much does it cost to join DC Fray? Your ringleader simply forms a new group during the registration process. Once they’re registered, everyone then registers under that group / team. Easy Peasy! Doesn’t matter how small your group is, we’ll keep your buddies together when we merge and finalize teams after registration is closed. Start telling your buddies to sign up now! What if I don’t know anyone in DC Fray? Can I still play? Absolutely! A large majority of DC Fray players sign up as independents or in smaller groups. Once registration for a division is closed, we merge all free agents and small groups into bigger teams, as space is available. Right off the bat, you’ll get to meet new people from your team alone, not to mention all the other players from the other teams as the season plays out! DC Fray is the EASIEST way to meet people and make new friends! ← What if I don’t know anyone in DC Fray? Can I still play? Lots of people join DC Fray for different reasons and sometimes you may find yourself on a team that you just don’t mesh with. No worries, shoot your league commissioner an email and we will find you a new home! We make the final call a few hours before the games the day of, but for the most part, we usually play through a light drizzle. Any lightening in the area and games are cancelled. At permitted locations that call to cancel is made by the operating DPR. We usually build one or more weeks of make up days in case of weather. If a league has multiple cancellations game MAY NOT be able to be made up. Call the Weather Hotline to check the status of your games: 202-290-1969 option 1. DC Fray has a no refund policy. Often our rosters have limited space and last minute cancellations hinder our ability to properly plan and organize the season and our leagues as well as the costs that have already been incurred by the league. If you would like to prepay for other players or for an entire team you have the option to do so when registering! Once you are on commish and at the option to “Choose Your Destiny” there will be an option to Prepay for Others. Simply enter the number of additional people you are paying for, create a prepaid code and your total cost should update next to the box. Provide your created prepaid code to your players to use when they go to register for the season to mark their registration as paid. Yes, we do offer the option to pay as a team. Since our registration is individually based the team rate is based on our Roster Table for an official roster size X the registration cost. For steps on how to pay for a team during the registration process please check the FAQ above. Every player must be a registered member on the roster. We do not allow subs/walk-ups/whomever to play with us without being a registered DC Fray player. Certain leagues CAN use subs as long as that person is registered in the same division. If you know in advance that your team is going to forfeit a game, we encourage you to call our office, at 202-290-1969, so as to help us notify your opponent. First… are you sure you don’t know them or that they aren’t a friend of a friend? Once you’ve checked there it likely means free agents or another small group has been merged onto your team. When groups do not reach full team size we merge groups and free agents together to fill out rosters. At DC Fray we’re on a mission to make fun possible. To us that means bringing people together. All of our rules & policies are built to reflect this mission. This is a DC Fray Coed Social League. These leagues are for everyone! Never played before? Great! Former setter for the US Olympic Team? Awesome! Players of all skill levels are welcome in our Social leagues: the number one rule is to have a good time. Games begin April 3rd and run weekly from 6:00-9:30PM(tent). Dates subject to change based on permits and availability and other league logistics. Number of teams to make the final tournament based on number of teams & league logistics. Teams will play 6 vs 6 and are required to have at least 9 players on their rosters. Please keep in mind that this is a COED division when registering. We welcome free agents and small groups and will do our absolute best to match players to teams. Please do not rely on Free Agents of one gender to be added to your team to fill it out. Dates subject to change based on permits, availability and other league logistics. Will you need your items delivered? Great! We’d love to post information about your business! Give us a little more information about you and we’ll be in touch soon! Drop us a quick message about what you're offering!